2) Works fantastic on an iPad mini w/ Retina (although there is a bit of load time when loading up the game)! 4) Lots of uses for MAX, the in-game currency. 1) Partners in the PSP DJMAX games had infinite uses. Neowiz Mobile monetizes them in this title by charging PREMIUM currency for every 10 uses. 2) The notes had special buffs as well. Neowiz dumbed them down to be aesthetic changes only. And for some reason, they only have 10 uses each too. At least they can be paid for with MAX points which are easily obtained by passing songs and completing challenges. 3) The game is quite expensive overall. Each tune costs $2 and song packs (which contain 4 tracks) are $6 each. To own everything will run a player over $100 and this is excluding future additions. 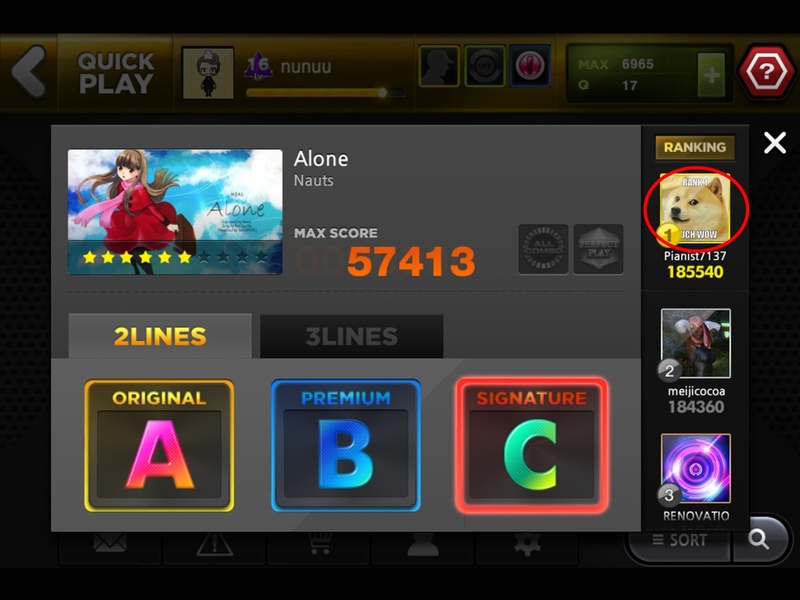 4) Typical DJMAX grinding. Wish they’d be more innovative in how users can gain MAX points and level up. 5) The tutorial pops up for EVERY song the first time you play them. I expect the dev to change this in a future update. 7) Neowiz Mobile treats ALL jailbreak users as thieves. DRM will prevent JB users from loading the game at all. My only other experience with the Technika series is DJMAX Technika Tune on the PS Vita. I prefer the game on my iPad mini with Retina over the Vita due to the former’s larger screen size. I also like the little weekly and regular challenges that Technika Q has. Sadly, the challenges are a far cry from Portable 2’s Xtreme Challenges which boasted a whopping 70 missions with increasing difficulty. The fun part of it all was that there were effects put in some of them that were meant to hinder the player such as flipping the play area 180 degrees if you missed a note or making notes fall slower when in Fever mode. It’s true that some of the things in the Xtreme Challenges would be difficult to implement or just plain infeasible for the player to experience in Technika Q especially given the drastic change in play style, but they may be what’s needed to break the monotony of the current ho-hum quests which mostly consist of playing x-number of songs multiple times with whatever additional conditions slapped on. It’s the whole “multiple times” thing that gets to me. It’s almost like those generic fetch quests in mobile RPGs or MMORPGs. 9___9 At least you’re rewarded with a chunk of MAX points from fulfilling them. There are also ones that reward the premium currency (known simply as Q) as well although I believe those are unique and aren’t recurring. 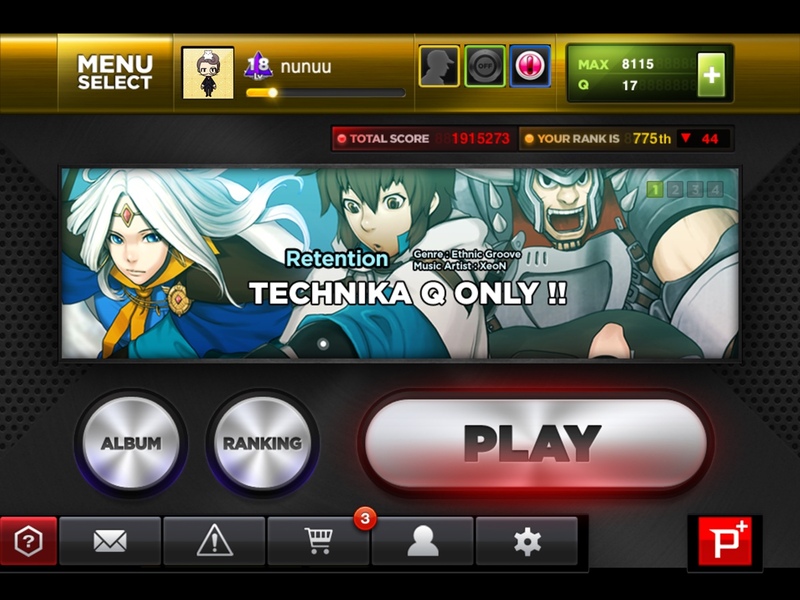 I’m still disappointed that the avatars/DJs/partners have a limit of 10 uses each in Technika Q. Even worse are the notes which no longer aid the player in any way. The only GOOD thing I see about them is that they’ll help me waste MAX when I upgrade all the Items and Effectors to their maximum level. I’m not sure how the rankings are calculated but I assume everyone’s score is reset to 0 every week? Anyway, for not playing very much, I think this rank is all right.